Your home in your hand. See how life changes with the Nest app. One app. For every home. And device. No matter which Nest products you have, or how many different types of phones and computers your family uses, the Nest app just works. It brings everything together in one place. So you don’t have to switch between apps. And you don’t need to program everything to work together. It all happens automatically. Control, when you want it. A thermostat in your pocket. Change the temperature from the subway or the sofa. See your home on your phone. Keep an eye on things when you’re gone. Hush alarms from the app. No more ladders. Silence alarms from your phone. A lot of apps can give you data. But it’s much harder to turn that data into something helpful. The Nest app doesn’t just tell you what. It also tells you why. Nest products can show you info you’ve never seen before – like why you used so much energy last week. What went wrong in an emergency. Or how many minutes someone was lurking at your door. This way, you can start to see patterns and understand your home better. Nest does the right thing. Homes are busy places. Someone comes home and turns on the lights. And the heat. And maybe an appliance or two. Then people leave, and someone has to remember to turn everything off again. When everyone in your home has the Nest app, Nest can do this for you. Nest can use the location of your phone as well as built-in sensors to do the right thing automatically - like turning off the heat and turning on the camera when you leave. We call it Home/Away Assist. When you add more Nest products to your home, they automatically work together and make each other better. You don’t have to figure out how to program them or deal with multiple apps. Nest products connect automatically. 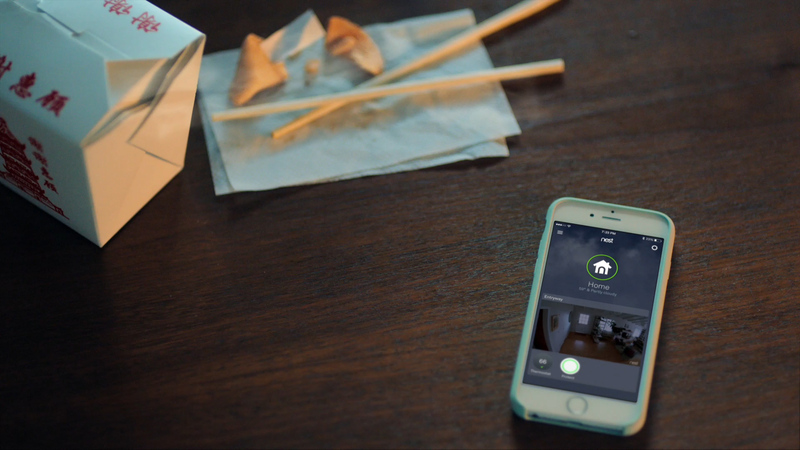 If Nest Protect senses smoke, Nest Cam Indoor will automatically turn on and save a clip so you can see what happened. Lights, fitness bands, washers and dryers – when they work with Nest, you don’t have to tell them what to do. They can connect automatically and work together to help you save energy, get comfortable and stay safe. Just turn your Works with Nest connections on and off in the Nest app. Nest Aware for Nest Cam. saves everything, just in case. you can make and share. that turn video into mini films. How it works. And what it works with.